The complete upgrade process seems simple but I am sure many would not agree with me. I was a bumpy ride to upgrade 3 components, below the flow diagram for upgrade of vCloud Automation Center 6.1 to vRealize Automation 6.2. The upgrade for Identity Appliance went well without a single error. Mine was a minimal installation, there are some additional steps depending on your distributed install. The actual issues started when I started the upgrade of vCAC Server Appliance. Check the step by step upgrade here. The procedure is pretty simple, where you just need to back up some configuration files, stop the services, check for updates and then install it. I was using the CD-ROM option to install the updates. The very first unusual issue I encountered was the "Check Updates" option, which remained in "Checking for available updates…" forever. There was no option to stop this process from looking for new any updates. Restarting the vCAC services, un-mounting the CD-ROM or even restarting of vCAC appliance was of no help. After reboot the status would still show "Checking for available updates…"
Well, this wasn’t a good symptom for upgrade, as it would hardly take few seconds to find any new Updates(like vRA 6.2) when you click on Check Updates. Now whenever I tried the above workaround to come out of loop and check again, it would again go into the same loop. Luckily after 3-4 hours it did detected the vRA 6.2 and when clicked on Install Updates it again into the same loop and failed. There wasn’t much in the vami logs. This is what you could do to install the updates(click here), make sure you backup config file and "ovf-env.xml" file. During my troubleshoot I happened to reboot vCAC appliance couple of times and then I Found that the "ovf-env.xml" file is empty. This was obviously failing the upgrade process while running the post-install scripts and ultimately failing the Install Updates process. 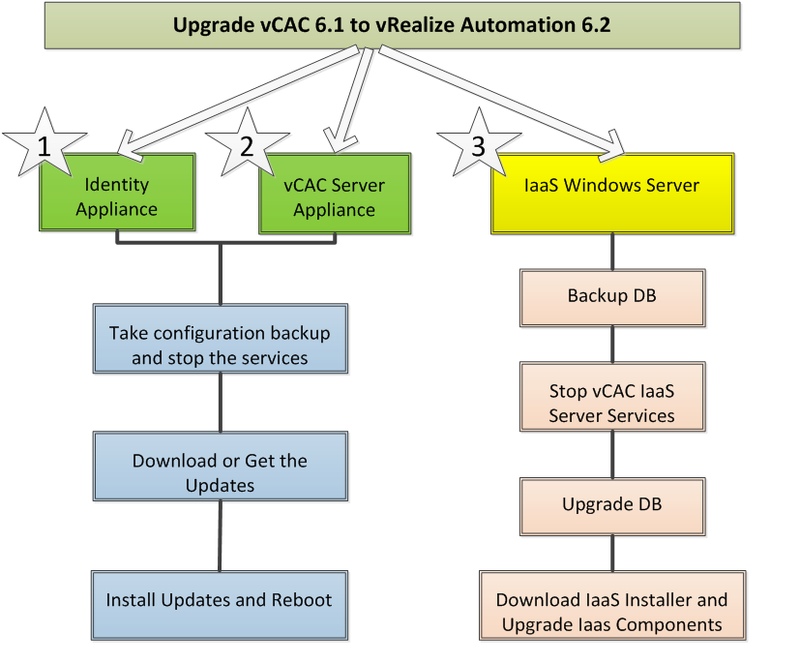 After the above solution and a reboot, the vCAC appliance was upgraded to vRA 6.2 (vRealize Appliance). I had spent more than 2 days to fix these unusual issues and thought it would certainly help others save time if they encounter these issues. Java version 1.7 or higher (64-bit) must be installed, the environment variable JAVA_HOME must be set to the Java install folder, and %JAVA_HOME%\bin\java.exe must exist. Micosoft .NET Framwork is installed. Build started 1/14/2015 11:25:52 AM. Project "C:\Users\administrator.PS\Desktop\db\Liquibase.xml" on node 1 (default targets). C:\Users\administrator.PS\Desktop\db\Liquibase.xml(28,5): error MSB3073: The command ""C:\Progra~1\Java\jdk1.8.0_20\bin\java.exe" -Djsse.enableCBCProtection=false -Djava.library.path="C:\Users\administrator.PS\Desktop\db" -cp "C:\Users\administrator.PS\Desktop\db\liquibase.jar;C:\Users\administrator.PS\Desktop\db\jtds-1.3.1.jar" liquibase.integration.commandline.Main --driver=net.sourceforge.jtds.jdbc.Driver --url=jdbc:jtds:sqlserver://localhost/"vcacdb";ssl=request releaseLocks" exited with code -1. Done Building Project "C:\Users\administrator.PS\Desktop\db\Liquibase.xml" (default targets) -- FAILED. Check the complete solution here. After this rest of the installation went well and I hope these notes would help you guys while you are running upgrade in your environment and save some time. I hope this was informative!! Bạn là một người năng động có lòng nhiệt huyết, bạn luôn mong muốn kinh doanh một chủ đề nào đó hay bạn đang cần làm web cho công ty bạn, nhưng bạn phân vân lo lắng không biết nơi nào mới thực sự là điểm tựa tin cậy của các bạn. ?